What to do with this? Put outside with a trio of Shubunkin Goldfish. 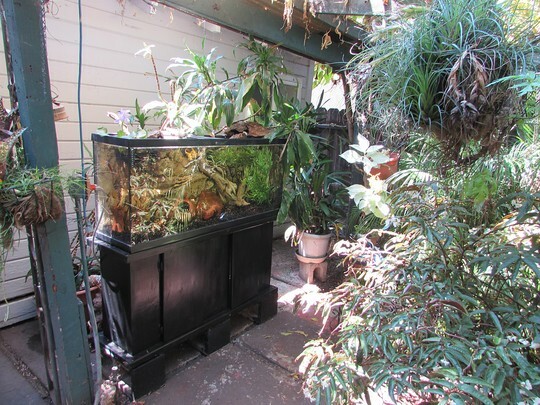 60 gallon/227 liter water tank. I painted the stand and then coated in varathane liquid plastic. There is also a fiberglass cover on the roof of that part of the patio. Looks great out side Stan you ve done a grand job. I use to have one but not being able to clean it out I had to give it my grandson. They take long arms to reach the bottom glass as you get into large Aquariums Penny. I had to re do my very largest tank as it was too hard for me to clean even on a stepladder...lowered it and so much better! I can sit and be eye level with the fish-ha. They certainly do Stan hence why I have mine away as my eldest grandson use to clean mine but when he got a full time job so my other grandson had it along with a stink pot turtle. I have one sitting out on my deck..not hooked up of course! Lost 17 goldfish in one winter indoors... couldn't keep the water well enough...even in a 60 gal tank. They were the survivors of a frozen over pond. Had 60+ fish at one time..then one winter my bubbler broke down after a huge snowfall in March and the pond became sealed with ice inches thick.. most of the poor things died of asphyxia. I had taken three to keep in the tank with my nymphaea..they were the only survivors. Sad fish story. It looks amazingly tropical and lush, Stan.. congrats!love shubunkins... they're so pretty. On youtube Lori,a man in Scandinavia put in hundreds of large Koi in his "Million gallon natural pond"...and learned the hard way that the thick ice with no aeration is fatal to the big fish. He tried AGAIN...adding a bubbler. I think he had another massive kill with the new fish. I think there is ice on a pond and there is ICE -feet of it- on a pond that really makes it hard to keep Koi and Goldfish in a pond. You might need a small heater to keep an open spot and I bet that would cost a fortune to run. Or a pond many feet deep. You might try Lori a plastic pond in a greenhouse? Not sure if you have one,or if you do you heat it at all. You should take a look at all he did..amazing how hard he tried...and starting with 150 large Koi- not small- must have been many thousands of dollars as they were also good looking Koi too,not ..the cheap stuff..lol. Even native fish can't survive pond life? Only the fish in moving streams? Interesting,as I never knew that about far north life. 4' is a very deep home pond too. Yes I would like to see it... do you have an address for it? In my last comment I made a boo-boo. 4 ft. or 48 inches and in some places 60 INCHES. We received almost five feet of snow in one storm back in 2009. I think it was 2009..will have to check my facts. but imagine digging down through all that snow, which was heavy and wet, to try to find the ice... then finding that the ice was so thick I couldn't crack it with my gardening shovel! I think I did a blog on here, will have to look for it. It's sad that he went to such pains to make something of beauty and forgot the essential...climate! Here's one part. He moved Heaven and Earth. In Japan.its a given it will snow and be cold every winter. Yet,they breed Koi by the gazillions. I guess its cold vs COOOOLD..ha. I noted that the cold pic was dated November! ...imagine Jan, Feb and March? That's a huge pond, though. He did an amazing job. He mentioned mink as a natural preditor..bahahahah! I have weasels, raccoons, mink and otters.